Tagged under Chika Umino, Production I.G, Series. This anime is an easy pick for the year's top honors as this near-future political thriller about an amnesiac guy, a cell phone, and the girl who gets mixed up with them topple others merely by dint of aiming for, and hitting with irresistible force, cuttingly smart, politically and socially relevant, and yet loose, human and funny enough that it's never forbidding or pretentious. Eden of the East is quite possibly the year's only "truly" great anime, few who give it a chance are likely to regret it. Even if the two movies were kinda let down, the conclusion of this weird and charming show is still, in a word, superb. This anime kept the mystery alive throughout the series, and when we figured it out, new mysteries arose. A great concept and story but maybe a bit strangely paced and relaxed for the grandeur of the main plot. As a side note, I feel a lengthened version to give more details on the other selecao and their antics would of enriched this story more. A friend of mine forced me to watch this after she got the boxset, and I thought it was amazing. Takizawa has got to be one of the cutest main characters ever. He's also a movie fanatic, which we have in common so it was funny picking up all of the movie titles he mentions throughout the series. I bought the show after my friend showed it to me, and I have both movies. It's a great series, though I was a little disappointed in the second movie ending...It's still a good show though and I recommend it to anyone who likes action and romance. Eden Of the East was an odd series, but good. I love the colorful artwork and the music too. Seemed as If it would make more sense to be an OVA then a series though. Honestly felt like anime's version of the Bourne series XD. Rewatch value: 9 worth buying: yes. It doesn't attract my attention at the first time, only recently when I was trying to find something to watch. I never was a fan of conspiracy themed show, but since it's by Production I.G, I gave it a chance. Annnnd I wasn't disappointed, mostly because the way they presented the show and Umino's characters designs. I was surprised at how good it is! The anime was great i loved the openings and the endings. I didnt like the jhonny parts. But the series overall was really good and enjoyable. An unexpected surprise that captured me from the beginning. Great concept and story line, even if the plot isn't completely clear in some points. I liked the idea of a crazy game that involves few chosen people that can make Japan a better place using a large sum of money and a phone that grants any request. The main character is very nice and I really LOVED the opening with the wonderful "Falling Down" by Oasis. OPENING THEME TEXT: "Let me walk with you when I'm lost in the wild. I know you always lead me to another Eden. Let me bless your name, O Lord. O Lord. Your words will never fade away. Since we believe you're the light on earth. Reveals the world." Very deep, relatable, and unique. Like how classic movie references, politics, and philosophy are mentioned in this anime. 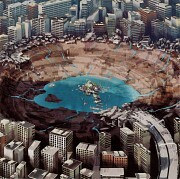 This anime made me think a lot about history, the economy, advanced technology, etc. and I learned a lot from them. Completed all in one evening... without doubt the plot is interesting, mostly because there's A LOT of mysteries to reveal. The main protagonist is a huge mystery himself, finding himself in front of the White House, totally naked, except of a gun and a phone in his hands. In addition he don't remember a thing about who he is. Among with the main female protagonist (who meets him for the first time like that.. she happend to be in front of the White House as well) they make a really lovely couple^_^ Overall the show is great and I can highly recommend it to everyone. Hope the two movies, which continue the story will answer my remaining questions. Even if I gave 9/10 for my personal rating, this anime well deserves even 10 to many of you there and that is true. It is almost flawless in every look and I only gave it that because I felt some emptiness on the plot at certain part and the end of the anime. But I am sure that it will continue just where it ended on the movies, which I will post a comment later when I have watched them. This anime only has 11 episodes and I do recommend on getting them on Blue-Ray if everyone can because it has a much bigger and better resolution. But if not, you will still enjoy every part of it on DVD as well. Thanks to its popularity it is easy to find it anywhere in all bigger stores. Also to note that the directors are the same that made the famous and one of the best anime movies "Ghost in the shell: Stand alone complex". This one is different, but still maintains that charm and that something what holds you on watching this anime. I really liked first part of anime - all these persecutions, the mysteries, Big Brother-like. The main character is interesting in its own way, though he reminds me someone (who saw Honey and Clover understand me. I guess the author has his fav type). The second and third part I liked less, as the economy and politics is not my hobby, and have a couple of inconsistencies in the plot. I really loved the concept of this series. Watched the first movie that goes with it, but haven't watched the second yet as I've read it's pretty much just a recap of the series. I am looking forward to the third one (I belive that there is one to come), to complete the whole series. This series looks really cute... I'm currently watching it in English via Netflix, but I sorta want to see it in its original Japanese language. I'm not crazy about the girl's super-cute/shy voice in English. I watched "King of Eden" first (kind of habit). Then, I continued to watch "Paradise Lost". And in order to understand the whole story, I watched the TV series. 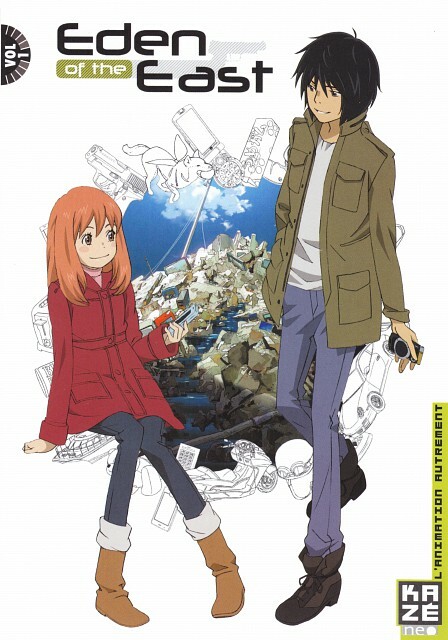 In my opinion, Eden of the East - or Higashi no Eden - is good anime. I like the story (I'm kind of fan of conspiracy plot). How unfortunate the plot is not really clear. What will happen to Saki and Takizawa next?! No feedback on Eden of the East.